"Healthy, nutritious delicious meal preps made with that homemade taste we all love! Healthy and tasty smoothies & protein shakes made fresh daily!" Historic Bristol on the Delaware has become a smorgasbord of uniquely delectable offerings. Everyone, no matter how busy they are, can eat a healthy diet when they take some time to plot meals out for the week. After working diligently all day, the last thing one wants to worry about is what there is to eat. Food choices are a part of life for every individual, a battle in the brain and impulsive eating leads to higher calorie intake. 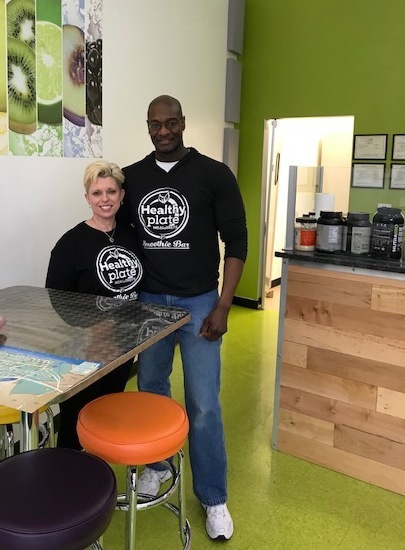 Problem solved…..the husband and wife team, Matthew James “Big Q” and Michelle [Hunt] Howard deliver healthy meal options for people on the go! Without a plan, one tends to eat out more, grab takeouts, or just go for unhealthy foods loaded with trans fats, added sugar, and artificial coloring. According to head cook Michelle, all the meals offered on their menu have a maximum of about 400 calories, and the incredible taste factor is never sacrificed. “It’s a healthy, balanced meal,” she said. Michelle began incorporating them into their own family dinners and Matthew, who is a personal trainer and self-described “fitness buff,” would enjoy every last delicious morsel. Michelle, who is originally from Kansas, and Matthew met through a mutual friend while he was still working for Comcast. She had previously owned and operated her own cake design business. They have two daughters, Elizabeth Landis, a BCCC art major with a goal of occupational art therapy who will be attending PSU [Ambler campus] next year, and Kennedy Renee who just celebrated her 10th birthday, a member of her school’s jogging club as well as an aspiring artist. Elizabeth is the Healthy Plate Smoothie Bar supervisor and she creates their smoothies of the week. meal preps and smoothie bar in August. Their menu clearly states under each item its nutritional information, including calories, carbs, protein and fat and their selections include pre-cooked well balanced entrees that are delivered on Sundays, an in-store “grab and go” cooler, freshly made protein shakes and creative, thick and creamy smoothies, nutritious wraps, delicious muffins, homemade soups in winter, salads and sandwiches, along with other healthy snacks available for their walk in customers. Matthew’s nickname is ‘Big Q’. He had been dubbed “Aquarius” when he sang in his group, Forté that had earned in his words, “a little buzz in a channel 12 contest in Philadelphia”. Aquarius was shortened to “AQ” then he dropped the A, now it is ‘Big Q’, “from the guys at the gym”. Matthew is an accredited International Sports Sciences Association [ISSA] Certified Personal/Fitness Trainer and an Owner, CEO, Fitness Specialist, a highly respected leader in his field as a fitness trainer for 10 years and a competitive body builder. He helped to shape and to enhance the amateur to the advanced athlete through customized and monitored fitness routines and basic nutritional programs structured for the clients’ specific requirements and needs. He has put his Flex N' Fit Personal Fitness training company on hold to invest all his energies in their “Healthy Plate” business. “I’m the ‘facilities guy’ and Michelle is the head cook along with chef Brian Doto who has elaborate experience in culinary, both overseas and in Europe. Meeting people is my favorite part. I love meeting people”, shared Big Q.
P.S. The “Big Q,” which everybody knows as the Number 8, is their most popular protein shake. Healthy Plate Meal Preps & Smoothie Bar has all MACRO-FRIENDLY healthy meals, delicious refreshing smoothies, and tasty protein shakes that are nutritionally well-balanced and MADE FRESH. All are invited to enjoy their in-shoppe amenity, a secure, free Wi-Fi connection while they eat-in or wait for their take home meals. Meal orders can be picked up or they can be delivered on Sunday. All orders must be placed no later than 8:00pm every Thursday. There has been an abundance of vibrant, positive reviews regarding the customers’ eating experiences. Everyone can relate to healthy, so their food relates to everyone! 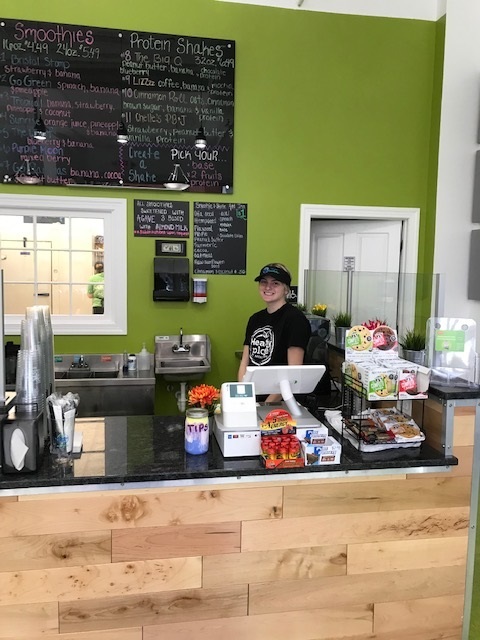 Healthy Plate Meal Preps & Smoothie Bar is their first bricks and mortar location, previously having rented a commercial kitchen in Hatboro. They love Bristol and its “small town feel”. Matthew already had strong ties to the Borough. His father was the late great BHS athlete, Gene “Beanye” White. Track star “Beanye” White, a 1970 graduate finished first in the triple jump, the long jump and the high jump at both districts and states in his junior and senior seasons. He was inducted into the BHS Athletic Hall of Fame, the PA Track and Field Coaches Hall of Fame in 1997 and received the Courier Times Outstanding Achievement Award in 1969 and 1970. His mother, Linda Ann Howard, was a cheerleader and a majorette when she met Gene at Bristol High. Linda raised Matthew, her only son, as a single parent. Matthew’s grandmother Josephine still resides in the Borough. Matthew graduated from Bensalem HS in 1989 and attended the University of Pittsburgh on a track scholarship to pursue computer science and business. His events were the high jump, triple and long jumps and the hurdles. He participated in the decathlon and pentathlon events in college. So HIGH goals RUN in the family. Matthew and Michelle’s goal is to provide their customers with nutritious, healthy option meals that promote a healthier lifestyle. And did someone say DELICIOUS? It’s that time again…… time to get your order in for a well-stocked kitchen. Carve out time early in the week and place an order no later than 8:00pm every Thursday. Check out their page to see what is on this week’s menu! Paper menus will be available at the Healthy Plate Meal Preps & Smoothie Bar on Mondays. Sunday delivery fees: Bristol/ Croydon $5.00; outside areas $10.00.